Those who have played TR4 know, that the DEMIGOD1 (the minotaur or hammer-god) aside from its annoying invulnerability to Lara's weapons also has the nasty ability to make Lara lose her grip on ladders and climbing walls when it pounds the ground near her. This requires a special setup, otherwise the DEMIGOD1 will just pursue Lara everywhere and stare admiringly at her behind when she climbs walls. You have to use AI_FOLLOW-nullmeshes and flipeffect 30-triggers to make this work. 1. You simply place two AI_FOLLOW-nullmeshes - one with OCB = 0 and one with OCB = 1 - in areas the demigod1 is able to reach. Their locations don't seem to have any special effect. 2. Place a flipeffect 30-trigger very near the trigger for the DEMIGOD1 itself, so it's 'born' with one of the two behaviours described below, and place flipeffect 30-triggers in the level, where you want this behaviour to change. It's the flipeffect 30-triggers, that hold the key to the behaviour of the DEMIGOD1. When Lara passes a flipeffect 30-trigger with timer = 0, it tells the DEMIGOD1 to shake her off walls. If she passes a flipeffect 30-trigger with timer = 1, it tells the DEMIGOD1 to leave her alone when she climbs. It will, however, stand right below her and stare at her as usual. 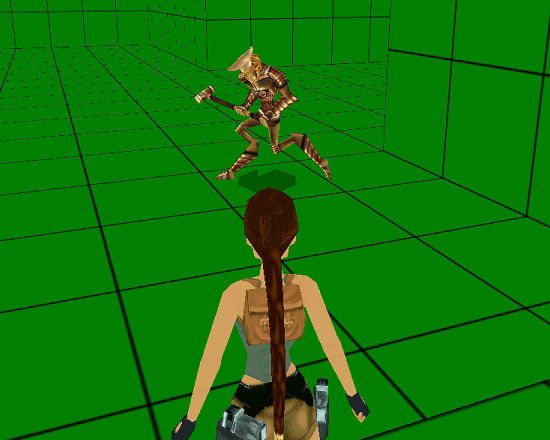 When Lara is within its normal reach (on the ground), her presence overrides the flipeffect 30-triggers, and the DEMIGOD1 will chase her around the level and try to harm her the usual way. But when she gets out of reach on a wall, it will act according to the latest activated flipeffect 30-trigger. If this is one with timer = 0, it will settle down and begin to pound the ground. And these small earthshakes will make Lara lose her grip on the wall and drop a distance about three clicks, before she regains her hold. Unfortunately for Lara, she doesn't get time to climb up again, before the next shake makes her drop further. 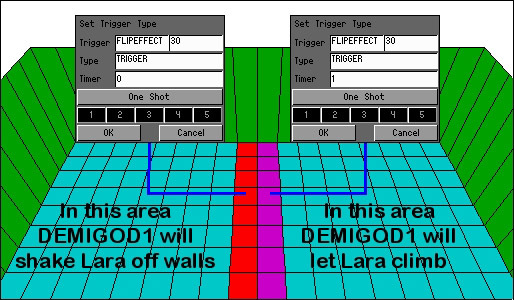 And the effect is reversible - if Lara passes a flipeffect 30-trigger with timer = 0 after a period, where the DEMIGOD1 has been under the influence of a flipeffect 30-trigger with timer = 1, it will shake her off walls again. So you have the power to create areas where Lara has the peace and quiet to climb, and others where the DEMIGOD1 makes her life miserable. However, the DEMIGOD1 is picky about the conditions, under which it gets the chance to shake Lara off walls. If it's not satisfied with the present conditions, it just walks away and circles the nearby area. The basic condition is that it must be quite close to Lara. If Lara's climbing in a room the DEMIGOD1 is able to enter, it will find a good spot and hammer away. And if Lara climbs walls in stacked rooms which the demigod1 is able to enter, it'll do the same. I doubt there's a limit to the height or number of rooms in between the room with Lara and the room with the DEMIGOD1, as long as they're stacked and no floor/ceiling separate the two adversaries. But if Lara climbs in a room the DEMIGOD1 isn't able to enter, its reach is very limited. It appears that the DEMIGOD1 must be a maximum two (2) blocks away from Lara, when pounding the ground. So if it must be able to shake her off walls (or simply have a chance to hurt her) in rooms it can't enter, those rooms must be extremely narrow and so must the area just outside of them. You have to think a two-block range into a setup if you want to have the DEMIGOD1 be in one room while shaking the climbing Lara off a wall in another. 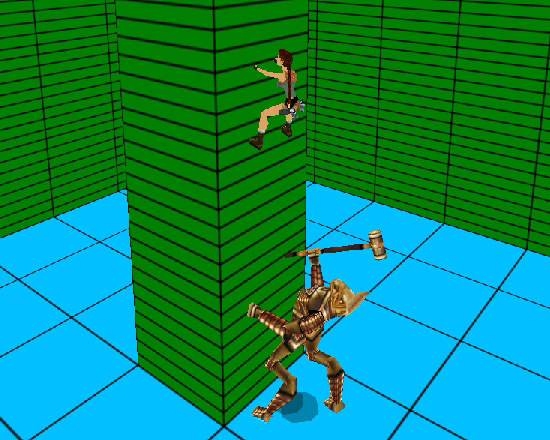 At least this seems to be Core Design's intention, but those who have played TR4 may also have experienced that while Lara was climbing a ladder in a part of the level far away from the DEMIGOD1, the noise and shaking from its hammer was suddenly experienced and Lara lost her grip on the ladder. I haven't been able to copy this effect and am simply forced to warn of this potential bug. Note: the DEMIGOD1 is only able to shake Lara down, when she climbs walls. She doesn't lose her grip if she shimmies or monkeyswings. Players have used this feature to make her climb walls, even if the DEMIGOD1 was busy shaking the ground below. The trick is to have Lara climb the very edge of the ladder/climbing wall, where she only hangs by her hands. Then she's not affected by the shakes. So if you really want to make it impossible for Lara to ascend a certain wall while the demigod1 is active nearby, I suggest you make a wide climbing wall and make certain that the top section of it can only be climbed in the middle section (by using sloping ceiling blocks, trapdoors or statics to narrow the climbable area). In TR4 the challenge was to lock the DEMIGOD1 up and reach and climb a ladder before the DEMIGOD1 got out and resumed its hammering behaviour. Quite a tight timed run, which is probably why players found the mentioned way around it. And of course, if Lara gets completely out of its reach - she's no longer on the ground in an area where the DEMIGOD1 can shake the life out of her, or climbing a wall it can make her fall down from - it loses interest in hammering and just circles the area nearby while it waits for a new chance to give her 'the shakes'.